"The thrill spectacle of the year!" 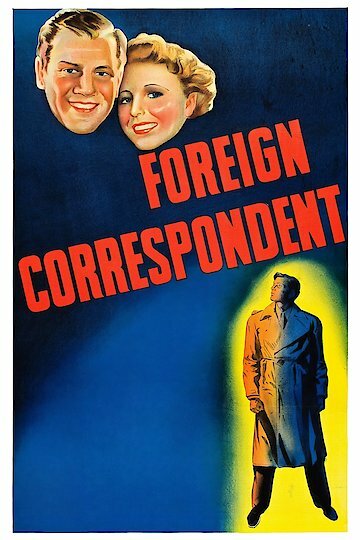 Alfred Hitchcock’s Foreign Correspondent is about a young and tough reporter for the New York Globe named Johnny Jones. The editor of the newspaper, Harry Davenport, gives Jones the pen name Huntley Haverstock and sends him to London to cover the political happenings in Europe. While on his first assignment, Haverstock gets mixed up in the assassination of a Dutch diplomat, Van Meer, who is the leader of the Universal Peace Party. Jones first meets with Van Meer on the way to a party. During the party, Haverstock meets a young woman, Carol Fisher, and her father. While talking with the Fishers, Van Meer mysteriously disappears. Haverstock is not worried because he will see Van Meer at a conference the next day. The day after the party, at the conference, Haverstock witnesses Van Meer get shot by an assassin pretending to be a photographer. When the assassin flees, Haverstock commandeers a car to follow him. Carol Fisher and another reporter are inside the car. Haverstock, aided by Fisher and the fellow reporter, follow the assassin to a building in the country. Haverstock goes in to investigate and sends Fisher and the other reporter to get help. Inside the windmill, Haverstock finds an unconscious but alive Van Meer. Haverstock realizes that the man who was killed must have been an imposter. Haverstock has to flee when Van Meer’s captors become aware of him. By the time help arrives, Van Meer and his captors have gone. Nobody believes Haverstock’s story, and he is forced to try to prove it. While trying to prove his story, Haverstock falls in love with Carol Fisher. As the two of them search for the truth, Haverstock begins to realize that Carol's father, Stephen Fisher, may have the answers he is looking for. Foreign Correspondent is currently available to watch and stream, download, buy on demand at Amazon Prime, Amazon, iTunes online.